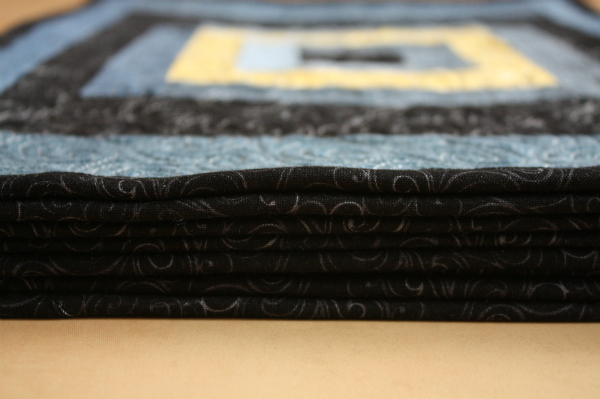 When I posted about my Denim Log Cabin placemats I had 8 tops pieced, but only two of them were quilted and bound. I finally got the rest of them quilted, and last weekend I finished binding them. This stack of placemats makes me so happy! I quilted them using the swirl hook design, which I learned from Angela Walters' video tutorial. For the first few placemats, I quilted it randomly, but then as I went along I realized that I could quilt it in a spiral so I did that for two. I couldn't believe the difference in the look of the finished quilting! 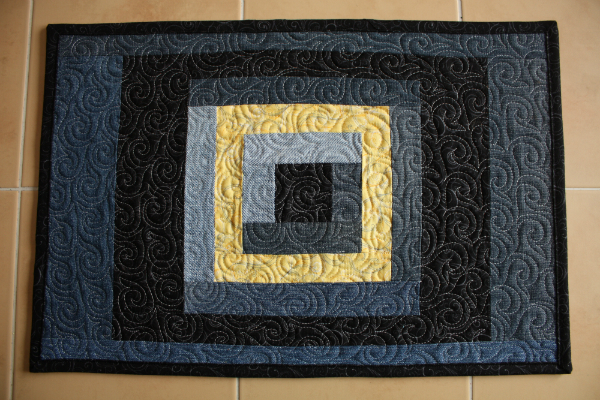 ...and one quilted in a spiral. See how when I quilted in a spiral the motifs end up looking like they're in rows? I also find they ended up more uniform in size and all facing the same direction. 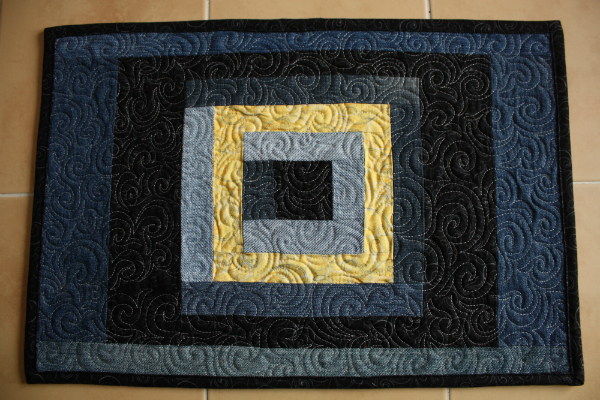 Personally, I like the random look better, but quilting in a spiral was certainly easier. When quilting random I had more of a tendency to quilt myself into predicaments, mostly because I left spaces between the motifs that were either awkward to get into or that I couldn't get into at all. Following a spiral path eliminated those problems because I was just building on the last row quilted. Have you ever tried quilting the same design in different paths? Did you find it made a difference in the look of the finished quilting? I'll be linking up with Let's Bee Social, NTT, TGIFF, Can I Get a Whoop Whoop and Finish it up Friday. This is an interesting post Leanne. No I haven't tried this but I might now. Very nice Leanne. I haven't tried doing that, it's an interesting observation, I'll have to give it a go sometime. I have definitely gotten myself quilted in to tight spots before. I tend to purposefully change up the path I use when quilting multiple items like placemats just to keep my mind fully engaged. The spiral version is really intriguing and seems worth a try! It is fun seeing it quilted in different ways. What a difference your quilting path can make. I usually go for random, but the spiral looks fun. These are beautiful. Great job on the quilting. I often quilt myself into tight spots. Need to work on improving that. Lovely placemats, and the quilting works well. Linking up via My Quilt Infatuation. Just got your link via @amyscreativeside on #igquiltfest and read this post. I am a novice quilter. Started working on my second full sized quilt just today. Actually warmed up doing a variation of spirals. It was fun and had am interesting look Sheff finished. I really like these placemats. I might be inspired now to try making my own! Thank you for this post. I'm so glad you found this post, Jerri! Spirals are so much fun to quilt. Have fun with your quilting! I love the quilting. Nice job. Oh I like how you tried different methods of quilting this pattern! I've definitely quilted myself into a corner before, so I can understand how the spiral path would be helpful to avoid that! Congratulations on finishing all these pretty placemats, Leanne! I prefer the look of the random quilting, too. But both are beautiful. It's fun to experiment and I'm all for doing whatever is easier, for sure! Wonderful idea for using up denim! With a piece this size, it is perfect for practicing FMQ! Which I desperately need to do, I am a walking foot devotee, just because my FMQ skills leave a lot to be desired. I love these! They are so great! I have to make some too! I'll add that to my list. Thanks for the inspiration. Using denim is such a good idea. I made denim coasters for my daughter a few years ago, they get used daily, and they still look like new. Newfoundland? I hail from Cape Breton! Hi, neighbor!